For a detailed description of new features please keep an eye out for our more complete new feature announcements in our blog. #20190404.12 - Bug (Work Item) - WIP Claims Due does not remove abandoned projects. - Filter by archived projects in "WIP Claims Due" on "Billing Release"
Failed and successful log in attempts will be shown in the Audit Log tab on the User Details page. Fixed label in Advanced filter. Fixed the wording of the help text. Fixed issue when rendering Supplier Invoices. Added additional column to grid. Changed search logic to treat spaces between multiple search terms as wild cards. Connection details for N-Central are validated immediately when setting up the connection in Harmony. Additional validation added to check for linked customers, assets or tickets when attempting to delete an External System Setup. Improved validation message when deleting From Addresses. Fixed spacing on generated commercial terms line for Purchase Orders. Removed ID fields from grouping options as they could not be used in the report generation. #20190207.12 - Feature (Work Item) - Audit Log for Setup changes. Audit log for legal entity and system settings. The billing report will now show the same information as the Review Summary. #20190314.13 - Bug (Work Item) - Event scheduler not navigating to the related object when the 'Icon' is clicked. Event icons on the calendar are clickable now and will take open the relevant event. A Work Item report has been added to the Operations > Reports > Tickets section. New columns Company Status and Company Type on Resources -> Contacts grid. Custom fields can now be added to the 'Pending Invoices', 'Unpaid Invoices' and 'Invoices Awaiting Export' grids from the column selector. Fixed bug that was causing the customer dropdown list on the asset search screen not to show the customer that it was currently filtering on. Added validation to check that Time Based Earning Rules have been set up against a contract when submitting time. Site search has been improved. From now the search uses simplified method of searching which is similar to "contains". But the old method is still available by ticking the option "Query syntax". Returning Not Found validation if there is a problem finding the external system configuration. Fixed bug that was causing the last saved filter on grids by users to be set globally. Added "Added Date" to Lead API results. Fixed issue with saving journal lines against wrong contract when contractor time is billed. Fix for incident rates are not saving tax rules. Fixed bug when expense line is being rejected and it was still appearing on the unassigned expense lines list. You can now override the browser culture language from the My Profile page. Added validation to the Tax Group Create and Edit forms. Only setting the Due Date for the Staged Payments created with 'Date' as the Billing Release Trigger now. Added Invoice External Reference, Invoice Subject and Invoice Date to grid. Fixed issue when search term contained a comma. Fixed issue with tax override. Fixed Accounting Period filter that wasn't working when selecting multiple accounting periods. Fixed bug that was causing decimal values in text custom fields to be converted to dates in csv downloads. - When phisical file doesn't exists on disk but it' on the database, show a non existent file image. Fixed issue with format when displaying the last four digits of the card number. Simple text correct was showing "Thank" instead of "Than"
Bug fixed when a new document added as a hyperlink. Fixed an issue when supplier invoice got posted and the validation message "should not be able to tag a supplier product family to a journal" prevents to continue. Added buttons to reprint End Customer Invoices. The bulk actions dropdown list has been added to the Work Items search grid as well as the work items grid in the Related Tickets tab of a ticket. Added option to email quote to customer contact in the Print dropdown on the quote. Added setting to change the default sales person on Quotes and Purchase Orders to the Current User rather than the Sales Manager. Additional comments added to report. Fixed issue with Favorited customers. When using Create Ticket option from outlook plugin, embedded images in the email body are now sent to Harmony at the same time. Fixed issue with team events displayed on calendar. Fixed timer title for Work Items that was not being shown in the Running Timers list. Fixed contact tag width to ensure that it always fits the container. Fixed issue that was causing changes to the Invoice Subject not to be saved. Term and annual total value on print view are now shown if tax row is hidden. Removed validation check on Internal Projects that was preventing them from allowing billable bookings. Changed default booking method for internal projects to Non-Billable Only. Additional columns added to grid. Fixed null object error when viewing quote in certain currencies. Updated expense calculations to use the rounding rules set against the Legal Entity. Fixed terminology in validation message. Fixed issue with confirmation message. Added new columns for Earned Type, Earned Unit, Earned Qty, Block Used and Invoice Reference to Time Bookings tab. Removed the option to update Custom fields for orders from the Sales grid as the gird is based on order lines, rather than orders. Changed Skipped date to show in local time, rather than UTC. Added null check on related ticket. Fixed contact validation on Rate Contract upload. Fixed the attachment files links on repeated documents for tickets and comments created by email. Fixed data type of Minimum Threshold fields. Added Account Manager and Support Manager to Customer information panel on tickets. Added annual value and term value totals on recurring, recurring blocks and recurring consumption lines to Quotes. Leads "Company number" updated correctly from company now when linking lead to company. Ignored product family validation for expense invoice line. Fixed issue with Consumption Rates upload. Fixed bug with validation for customer and supplier consumption rate uploads. There was an issue when entering time on time sheet in different regions which has now been fixed. Now webhooks can authenticate using Basic Authentication. Also the body of the webhook has been converted to using a razor template, enabling you to add logic as to how the request is formed. Fixed issue with pricing unit for recurring blocks. #20190301.12 - Bug (Work Item) - Error: Profit Drilldown - Object reference not set to an instance of an object. #20190304.3 - Bug (Work Item) - Error: Ticket Update - Nullable object must have a value. Fixed issue when booking time against billing methods that have a 0 price set. Fixed issue with missing paging buttons for grids on small screens. Fixed issue with dropdown list. Fixed bug in calculation that was incorrectly counting team members with 0% Percentage Of Time set in Availability Percentage. Fixed naming of Auto Generated budgets and bug that was resulting in budgets not being auto created if the requested day was the first day of the new budget. Made Asset Ownership field read only as it is a calculated field. #20190228.15 - Bug (Work Item) - Error: Continuum - Object reference not set to an instance of an object. Fixed report subscription data that was incorrect after a change to the grid data. #20190304.21 - Bug (Work Item) - Error: Rules - Parameter 'relatedObject' as Action is required. Fixed data issue with outdated rule setup that was causing errors on some instances. Fixed bug that was causing rows not be sort over deleted rows. Added the ability to upload supplier rate contracts for consumption. The Aged Creditor report now includes supplier invoices that are created as a result of the employee expenses process. Fixed issue that was causing assets to show contract coverage as "Yet to Start" when the schedule is set to auto-renew and they are in their 30 day renewal period. Fixed the Product Item tax group override when applied on ticket charges. Added field definitions to Sandbox for API endpoints. You can now click on the "Model" tab to see a list of properties along with their data types. Fixed issue with checkbox on the Pending Invoices grid that was preventing multiple selected invoices from being released at the same time. Fixed issue with linking pdf attachments to tickets that were created by emails that contain inline pdf files. 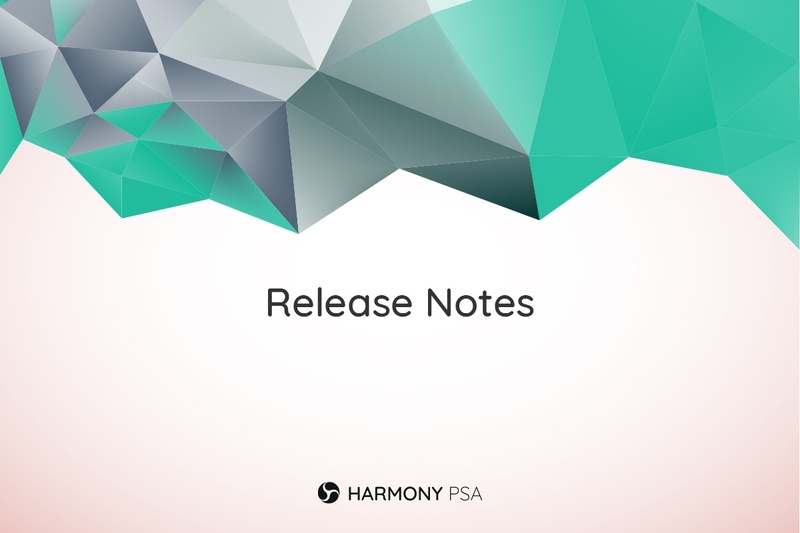 When uploading comments allow the harmony ticket ref to be referenced or the original imported ref with prioritization given to the latter. The down arrow now targets the correct section. The "Add" button should now still be visible on small screens. Fixed json length issue when importing assets from Ninja RMM. The response from the server after adding an Post or Event via the API will include the Core Object ID that the post or event was associated with. Now when exporting invoices to file, the order of the lines in the file matches the order on the invoice.